Prime Minister Narendra Modi on Saturday launched the subsidised scooter scheme for working women on the 70th birth anniversary celebrations of late leader J Jayalalithaa. It was launched in the presence of Tamil Nadu chief minister K Palaniswamy and his deputy O Panneerselvam, among others. 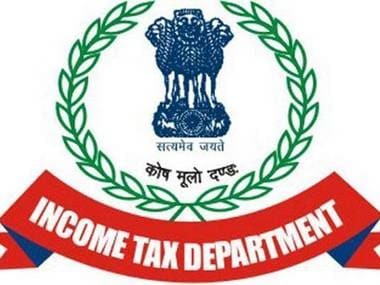 The scheme, with a subsidy component of 50 percent up to Rs 25,000 for working women, was launched by Modi, who handed over the keys and registration certificate copies to five women beneficiaries. He also launched 70-lakh tree sapling planting drive to commemorate the 70th birth anniversary celebrations of late Jayalalithaa. Modi said that the new initiative will go a long way in women empowerment and protection of nature. "When we empower the women in the family, we empower the entire household. When we help with a woman's education, we ensure that the family is educated. When we facilitate her good health, we help keep the family healthy. When we secure her future, we secure future of the entire home," he said. 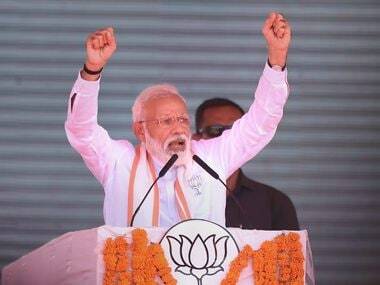 Elaborating on the NDA government's efforts to empower women, the prime minister said they made a change to the Factory's Act and suggested the states allow women to work night shifts as well. "Under the Pradhan Mantri Awas Yojana, the registry of the house is done in the name of the woman," Modi said. Talking about the Jan Dhan Yojana, he said that out of 31 crore Jan Dhan accounts, women hold about 16 crore accounts. The prime minister also took a dig at the Congress. "When there was a Congress-led government at the Centre, Tamil Nadu received Rs 81,000 crore under the 13th finance commission. 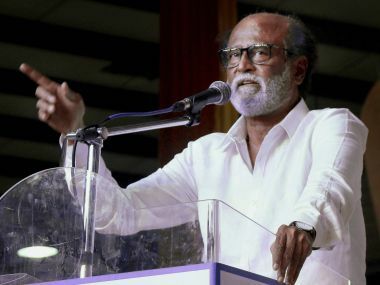 After the NDA came to power, the state received Rs 1,80,000 crore under the 14th finance commission," he said. 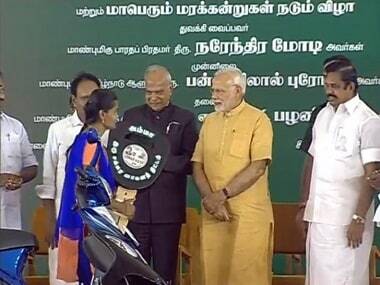 Modi also said that 9.5 lakh women in Tamil Nadu have benefitted from the Ujjwala Yojana. "Union government has so far given 3.5 crore free gas connections under this scheme. The schemes of Union government are protecting nature even as we empower women," the prime minister said. 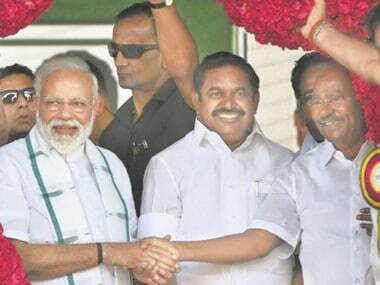 Meanwhile, Palaniswamy in his address urged Modi to take steps to set up the Cauvery Management Board and the Cauvery Water Regulatory Committee, as directed by the Supreme Court. These included 'thalikku thangam,'(gold for mangalsutra) for women beneficiaries, free milch cow and goats, free of cost computers for students and new colleges for the uplift of rural students. Hailing Modi, Panneerselvam said the prime minister was "courageously leading India." Stating that Amma had implemented several schemes for the safety and well being of women, right from their birth to old age, Panneerselvam said the scooter scheme too envisioned by the late leader, was for people's welfare and development. He said this scheme too would be the forerunner for other state governments, like other previous initiatives. So far 3,36,103 women have applied under the scheme and scrutiny of such applications were under process, according to the ruling AIADMK. Palaniswamy had announced in December last that scooters would be distributed to one lakh women at a subsidised rate on the occasion of Jayalalithaa's 70th birth anniversary. Earlier the prime minister was welcomed by Governor Banwarilal Purohit, Palaniswamy and top State officials at Chennai airport. From there, he flew to INS Adyar Naval base near Marina beach, from where he reached the function venue by road. The prime minister, who planted a sapling to mark the event, is scheduled to stay at Raj Bhavan here later tonight and leave for neighbouring Puducherry on Sunday. The subsidised scooter scheme for working women is an electoral promise of late Jayalalithaa. During the 2016 Assembly election, she had promised 50 percent subsidy for women to purchase two-wheelers. Last month, the state government increased the subsidy component under the scheme from Rs 20,000 to Rs 25,000.